Life is better with a little spice & a lotta comfort food. What could be more comforting or nostalgic than a warm cup of homemade hot chocolate with marshmallows in your hands in the winter time? This recipe combines just three ingredients to make a rich cup of hot chocolate. Whipped raw cream or homemade marshmallows make this drink truly decadent. We don’t drink store-bought hot chocolate in this house because…well…it isn’t real! And quite frankly, it doesn’t taste as good. Just take a look at the ingredients in Swiss Miss instant hot chocolate mix! Ingredients: sugar, modified whey, cocoa (processed with alkali), hydrogenated coconut oil, nonfat milk, calcium carbonate, less than 2% of: salt, dipotassium phosphate, mono- and diglyderides, artificial flavor, carrageenan. Why settle for fake when you can have the real thing? Whisk ingredients together in a medium sauce pan on medium-low heat. Stir until hot chocolate is warm, but do not let the milk ever come to a simmer. It takes about 5 minutes, and you want to watch your pot, or it might bubble up and overflow. Line an 8″x8″ or 9″x13″ baking pan with parchment paper. Leave enough so that it comes over the edges. Next, mix 1/2 cup of water with 3 TBSP of grass fed beef gelatin in a mixer bowl (or a large bowl if you’re using hand-held beaters). In a medium sauce pan, mix 1/2 cup of water, maple syrup or honey, vanilla, and salt. Bring to a boil and monitor with the candy thermometer until the mixture comes to exactly 240˚F. Then immediately remove from heat. This will take between 7-8 minutes. Gradually stir the syrup mixture into the water and gelatin, and then mix on high for about 10 minutes, or until it becomes thick and fluffy. Then, pour into the baking pan lined with parchment paper, and smooth it flat. Coat your fingers in butter or coconut oil if you wish to use your hands to pat it smooth, as it will keep your fingers from getting sticky. Let the marshmallows set for 4-5 hours or overnight. (Overnight is better.) And then cut into squares. If you like, you can toss the marshmallows in coconut or almond flour (to keep them from sticking) and other things to flavor them, such as coconut flakes, spices, or cocoa powder. 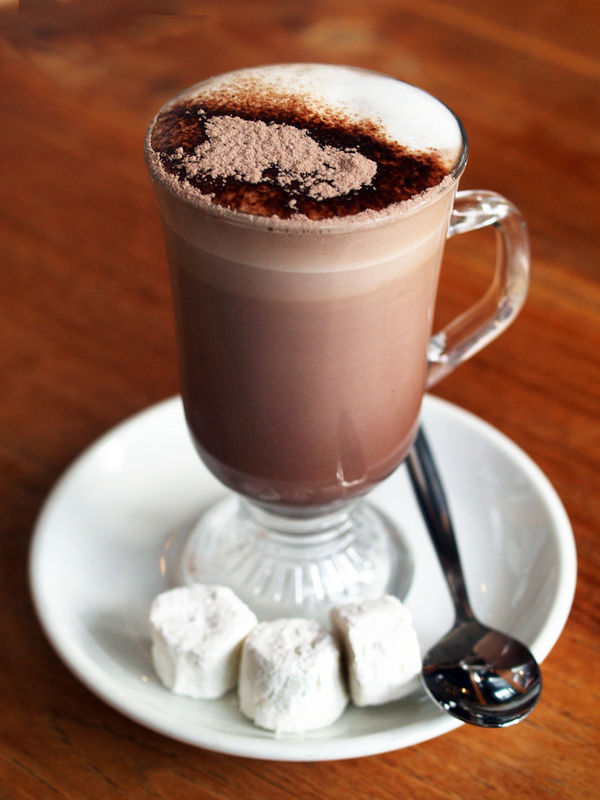 Enjoy your homemade hot chocolate! Whip in a bowl for 10 minutes or until fluffy. It helps if your cream is cold. I made homemade grenadine today. Hi, may I know where do you purchase raw milk from in the bay area? Which brand? Thanks! your marshmallows look AMAZING! I have always wanted to make them..are they pretty easy? ok, i have to try this soon. We missed out on the marshmallows for Thanksgiving because I was sick and did not make them..I have to make it up to the rest of my family :) thanks! © Revived Kitchen • All Rights Reserved • Web Design by Hey, it's Courtney!